Kintsugi Repair Kit (a.k.a. Kintsukuroi) | Mejiro Co.
FOR INTERNATIONAL CUSTOMER: PLEASE READ BEFORE ORDERING!! Also check out our "Kintsugi Repair Kit with Low Allergenic Urushi"
Kintsugi (or Kintsukuroi) is the Japanese art of using lacquer, mixed with silver, gold, or metalic powders to repair broken pottery/porcelain. The philosophy behind this technique is to treat the repair as part of the object’s history as opposed to treating the repair as something to hide as if it never happened. 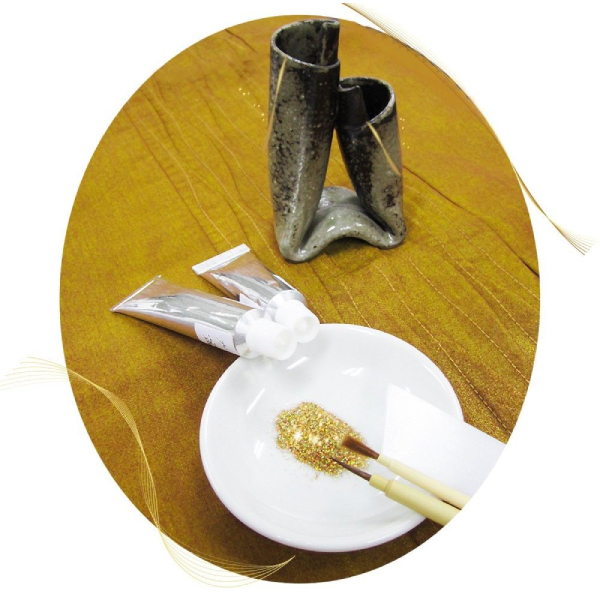 You will repair in a traditional method using real urushi lacquers, without any artificial materials.With the Kintsugi Repair Kit, it is possible to effectively repair damaged pottery/porcelains. The resulting repaired pottery will be both visually appealing and durable as well. The Japanese have been using lacquering techniques for approximately 9,000 years, and this skill and art form is still valued to this day. Contents: Urushi Lacquers x2, Paint Brush x1, Powder Removal Brush x1, Alternative Gold Powder x10g, Natural Pearl Powder x10g, Plastic Spatula, Pure Silk Cotton, Small Plate, Rubber Glove (Medium), Tonoko Powder, Water Resistant Sand Paper, Easy English Manual. *See below for an additional shipping fee. **Sorry, we do not ship to China and Italy at the moment. Caution: Urushi lacquer is actually the sap of a tree that grows in East Asia. It is a natural substance that forms a clear, hard and waterproof surface when dried properly. Urushi contains a compound that can cause a reaction similar to poison ivy, so please take necessary measures to protect yourself. NOTE: TURPENTINE OIL included in our Kintsugi Repair Kit is now prohibited from export from Japan therefore we cannot ship abroad.